Remember the languid crooning of Ella Fitzgerald singing about the lazy hazy days of summer? Sounds idyllic if you are poolside enjoying a cocktail, or ensconced in waders, immersed in cool rushing waters flying fishing. 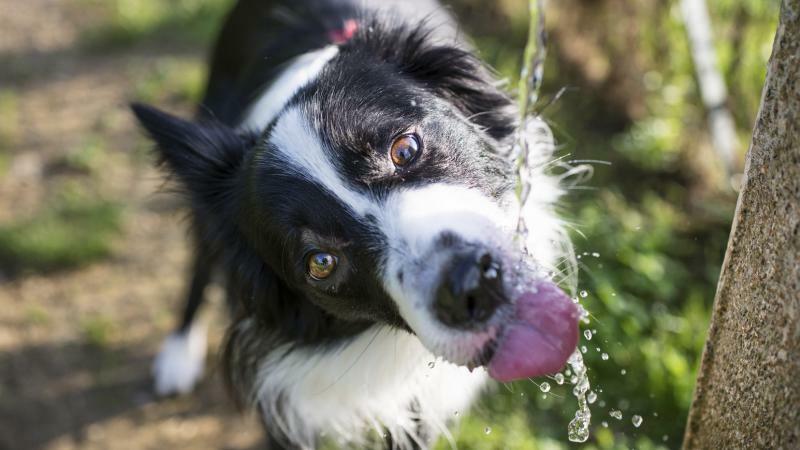 For our four legged companions, summer heat is not as much fun. Is it just me, or is this particular summer hotter and more humid than the last few years? Seems too, there are more cases of dogs being rescued from the confines of locked cars in searing summer heat. On a positive note, more people are willing to step up and demand extrication before the death of the animal, but still and all, a larger segment of the population either feels it isn’t too uncomfortable to leave the dog in the car or they are simply underestimating the length of time they will be away. We all enjoy the company of dogs riding in our trucks and cars: in fact, windows are always rolled down in my vehicle so that various Boxer heads may poke from each available window. I am convinced the sound and fury of collective ears and jowls flapping around in the air currents created while driving, is a supreme canine pleasure. What can never be a pleasurable to dogs is being left in the car on hot summer days. Heat stroke is real for man and beast alike. Humans have the choice and willingly decide to brave the noon day sun like proverbial mad dogs and Englishmen. Dogs, if given the choice, will seek out the coolest, shadiest place they can find. Their only heat resolving mechanism is panting and sweating through paw pads. Heat stroke happens when heat gain exceeds the body's ability to dissipate heat. High temperatures cause chemical reactions that break down body cells which lead to dehydration and blood thickening. This puts extreme strain on the heart and causes blood clotting and subsequent death to tissue. Liver, brain and intestinal cells are usually the first to be affected and this can occur quickly. Normal body temperature for a dog is about 101 F to 102 F. If his temperature reaches 106 F, he is in danger of brain damage, vital organ failure and death. Reducing body temp quickly is imperative. A dog who recovers can still have organ damage and lifelong health problems. Temperatures above 106 F are extremely dangerous. Imagine you’re trapped inside a parked car in 80-plus degree heat. The windows are open a crack. The temperature is rising, and you have no water. On top of all this, imagine you’re wearing a thick coat and that you have no idea when you’ll be able to get out of the car. Sounds horrific doesn’t it? Even on a relatively cool 75 degree day, a car parked in the sun can reach 160 degrees in 15 minutes. Take an image of the car including the license plate on your cell phone. Note the make, model, color, of the vehicle and a description of the animal therein. Proceed to the customer service desk of the store. Demand to talk to the manager immediately and ask they make an announcement over the store PA system asking the owner of.. to come to the service desk. If you encounter push back from the store – advise you will call the police for help. Ask that the store manager accompany the owner to the car. Observe if the dog is removed from the car. Offer to help with emergency veterinary care if necessary – transport to a veterinary facility close by if the dog is in severe distress. Meanwhile ask for ice to help cool the dog down. DO NOT break a window to remove the dog yourself. The best advice to anyone who thinks their dog will be upset that they did not accompany their owner on every road trip around town during the Dog Days of Summer, is to leave her home in the comfort and cool of your home. And, to those animal advocates who use their voice when encountering a dog in need: “thank you for speaking up”.